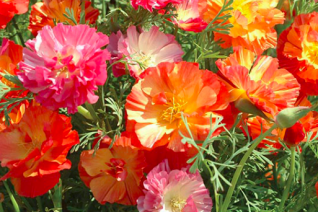 Spectacular mix of double flowered California Poppy in shades of pink, yellow, apricot, rose, red, orange, and yellow- and more colors than that. Easy to grow plants that can even be perennial if happily sited and cared for. Otherwise an incredibly showy annual that also makes a great cutflower- cut in bud and they will last several days. Sophisticated selection of our own native poppy and they will most likely reseed in open disturbed sites. Blooms May-August and sometimes longer. Remove spent flowers to encourage more. Leave the final round of blooms to set seed for the following season. 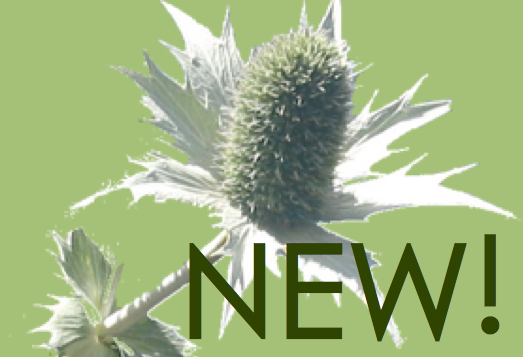 To 1′ x 1′ with beautiful lacy glaucous foliage. Rough areas in full sun with light summer H20. Highly deer resistant. Oregon native plant. A very favorite annual or short lived perennial. 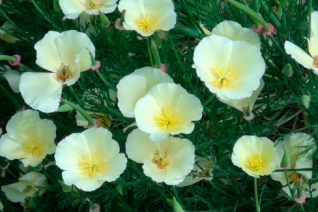 This excellent California poppy sports ivory to cream large flowers for an extended period in summer. Fine blue foliage is wonderful with the softly colored flowers. Blooms from April to August if you give it a little water- but never soggy. Full sun to the very lightest shade in average to enriched, well drained soil. Un irrigated plants will bloom for a shorter period and set seed. The seed comes true about 90% of the time. Cull orange or other colors that don’t please you. It may become a short lived perennial if treated well. New plants germinate en masse with the first autumn rains. Don’t be afraid to thin your patch a bit then. Rough areas, along gravel paths. Easy to grow. Containers, Hellstrips. Etc. High deer resistance. Oregon native plant.